This would make a nice addition to BBQs. 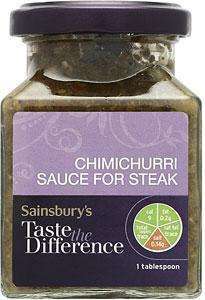 Chimichurri is a Latin American spicy coriander sauce to add on meat (especially barbequed). For 32p (originally £1.29) I think it's worth a try! Cant make your own for this price so hot from me, although I would sooner spend the extra and make fresh. If its anything like home made its great on meat as well as Veg on the BBQ. trigger_andy, agree with you, I was thinking of making it for a while - but never got around making it! Obviously it's not like freshly made, but one can add some fresh chopped coriander for a fresher taste. I would have not bought it at full price, but at 32p I thought it's worth trying. The finest condiment the world has ever tasted. I salute you Jimmy McCurry for inventing this or whatever your name was. Argentina loves you. The finest condiment the world has ever tasted. I salute you Jimmy … The finest condiment the world has ever tasted. I salute you Jimmy McCurry for inventing this or whatever your name was. Argentina loves you. Brother in law lives in Argentina and he told me the story. He invented it but the natives couldn't say his name and when they did it sounded like Chimichurri and it stuck. Homemade is better but it's expensive to make cos of the oil and white wine vinegar so this is a great deal.